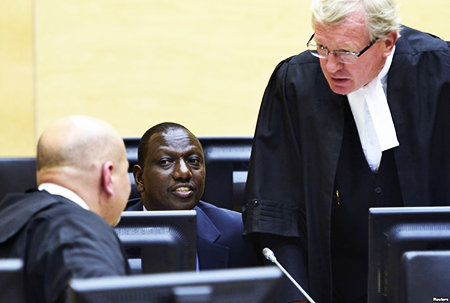 Home / Africa / ICC turns down William Ruto’s request. The International Criminal Court in The Hague has turned down a request by Kenya’s Deputy President William Ruto to be tried in his home country. It said it was in favour of bringing proceedings closer to the affected communities, but had made its decision taking into account cost and security. 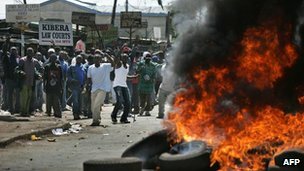 Mr Ruto, along with Kenyan President Uhuru Kenyatta, is accused of orchestrating post-election violence five years ago. Both deny the charges. His trial is to start on 10 September. Mr Kenyatta, whose trial is set to begin on 12 November, has made a similar request on which judges have not yet ruled. Another factor the judges considered in their decision not to move the trial was “the potential impact on victims and witnesses”, the ICC said in a statement. Last month, the court said Mr Ruto only needed to be “physically present” at key sessions of his trial after he requested whether he could participate in the trial via video link. Mr Ruto and Mr Kenyatta were on opposite sides of the 2007 election, after which some 1,000 people were killed and 600,000 people fled their homes. But they formed an alliance for March’s election and analysts say the ICC prosecutions bolstered their campaign as they presented it as foreign interference in Kenya’s domestic affairs. The African Union has been pressuring the ICC to drop the charges against Mr Kenyatta and his deputy, saying it was being racist in only prosecuting cases from Africa. The ICC has refused to drop the charges, saying it pursues justice impartially.